This Double lesson plan has been created specifically for the teachers delivering the 10th grade ‘Keep Talking’ programme in Israeli high schools. I suggest using the lesson in one of the first lessons of the year in order to get the students thinking about their oral proficiency, and to make them aware of the different techniques and strategies available for effective learning. I have included the lesson plan and the PowerPoint for you to use with your classes. The link to the student Self-Assessment Google Form is in Task 3 in the lesson plan itself. I hope you and your students enjoy the lesson as much as I did. Bullying is brutal. 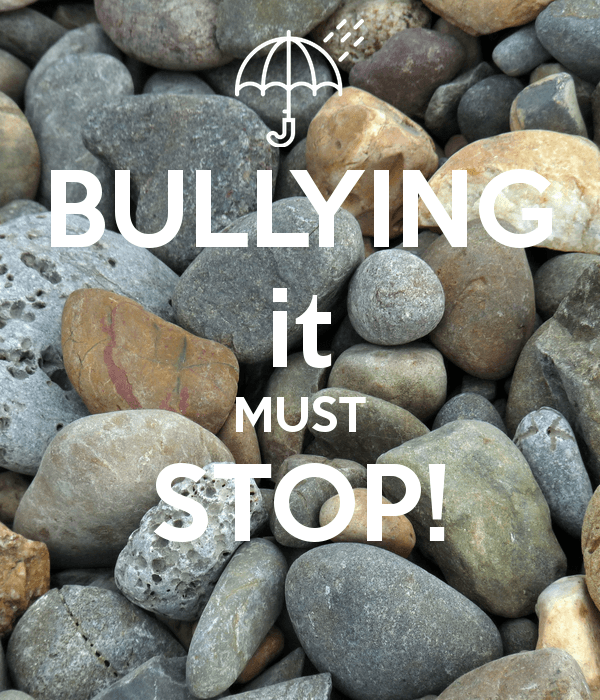 It always has been, and probably always will be an issue that too many children and teenagers have to deal with, both at school and now, due to cyber-bullying, at any time and in any place. I created this lesson after seeing a short JuBafilm – A Piece of Chalk – whilst invigilating a 12th grade Cinema Studies class. The speaking booklet, that I have been using with my 10th grade ‘Keep Talking’ class, has a whole unit devoted to the topic of bullying, so I simply adapted that unit to incorporate ideas that were raised by the film. This 4 lesson unit plan includes a mix of speaking activities: two oral presentations, and another short film – Listen to Me – which deals with the concepts of stereotypes and bullying. The lesson plans are aimed at students from both intermediate and proficiency levels (CEFR levels B1 – C1). I have provided suggested times, however, the lessons may need more or less time depending on the class. I have included the lesson plan and the PowerPoint for you to use with your classes. As I continue to work with my 10th grade students in the new ‘Keep Talking’ programme, I have created two lesson plans to supplement the approved speaking booklets. The lessons may be used to supplement the travel units, in each of the books, or as a standalone ‘speaking’ unit. The lesson plans are aimed at students from both intermediate and proficiency levels (CEFR levels A2/B1 – C1). I have provided suggested times, however, the lessons may need more or less time depending on the class. My overarching objective in this course is to get the students speaking in pairs and small groups, and to make sure they both increase their lexis and their confidence, in a fun and engaging learning environment. A song to get students speaking! Speaking is the most challenging of the four skills to teach in large heterogeneous classes. As speaking is interactive and demands an almost instant response, the pressure to ‘perform’ is often overwhelming for students. 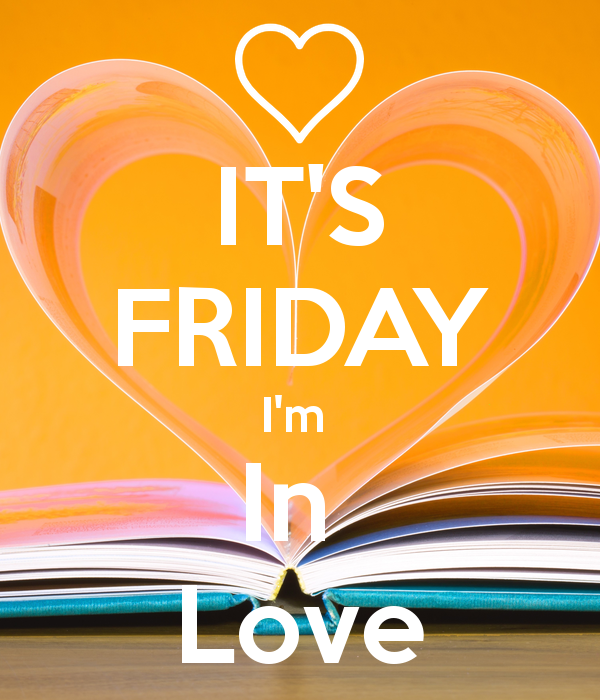 With this in mind I created a fun lesson plan based on the famous song ‘It’s Friday I’m in Love’ by The Cure. Not one of my 10th grade students knew the song but they all quickly ‘fell in love’ with it. My aim was to get the students speaking and using the lexical chunks from the song. However, to my amazement they quickly began singing the song, and asked me to play it again and again. 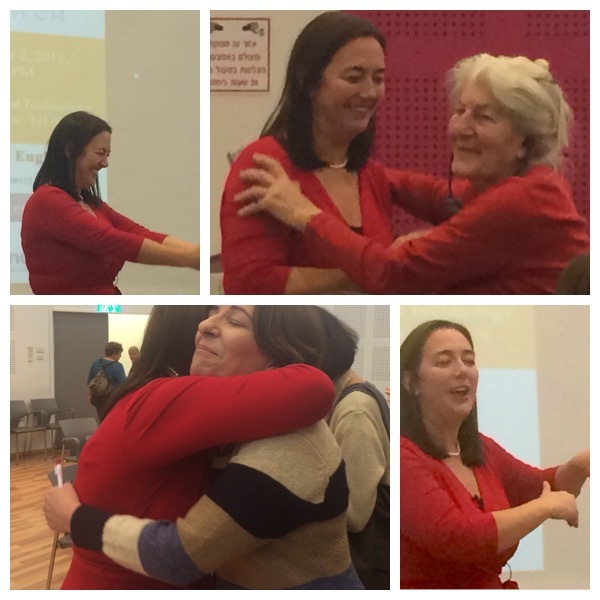 As the convener of the Q & A session I would like to share with you some of my post-event reflections. Firstly, there was no need for the panel to prepare anything in advance, which enabled them to communicate directly with the audience, and to answer questions spontaneously, on their area of expertise, without investing further time in preparation in contrast to a Pecha Kucha evening (see Pecha Kucha and the Power of (saying) ‘Yes’). Secondly, we decided to use Todaysmeet to source questions from the audience, because it is user friendly and has a good visual layout, and meant we did not need a person running around the huge auditorium with a microphone. Lastly, as the panel members were all experienced conference presenters they understood that the aim of the evening event is to keep things light, fast-paced and informative. 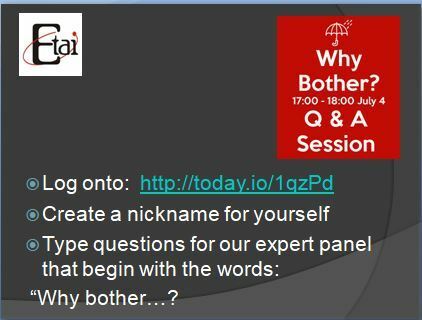 Create a slide with instructions and a URL address to source great questions, and enable audience participation, as soon as they enter the auditorium. In order to keep the Q & A session fast paced, use a timer, and tell the plenary speakers that they have 2 or 3 minutes maximum to answer a given question. Note, I didn’t do this but would do next time. If you want to remember any of the panel’s answers record the event, as it is really difficult to host and remember what was said. Again, I didn’t do this but definitely will next time as I missed out on so much personal learning. Here is a sample of some of the questions sourced from the audience, and answered by the panel. Why bother giving our students homework when we know they won’t do it anyway? Why bother telling my friends how good ETAI conferences are when they never come? Why bother trying to build up the school English library when kids don’t read books anymore? Why bother teaching a 45 minute lesson when students can’t stay focused for that long? 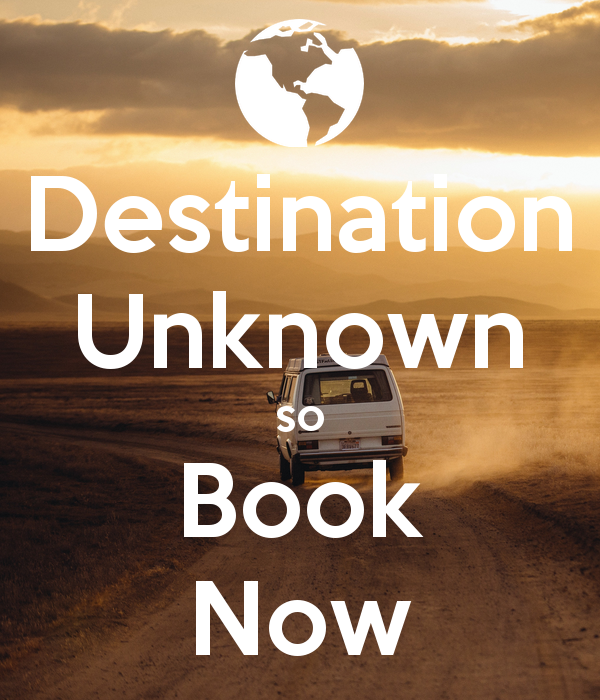 Why bother travelling when we can meet online? Why bother teaching Shakespeare when no one speaks that way anymore? Why bother trying to get pupils to read books, they’ll never read enough books to really improve their English. Why bother teaching English when they plagiarize and use Google translate and don’t understand what’s wrong with it? Why bother correcting them on present perfect errors when there are more people in the world who use it incorrectly than those who do? Why bother teaching vocabulary if the students can use electronic dictionaries? Why bother going to IATEFL conferences abroad? Why bother spending so much time with grammar when the goal is communication? Why bother teaching them literary terms? Why not just deal with the message and the useful vocabulary? Why bother using grammar books with gap-fill activities? Why bother with spelling tests when our pupils will write e mails and use electronic notebooks in their future? Why bother giving written feedback on student drafts when they do not bother correcting their work accordingly? Why bother making kids read books when they don’t even read them in their own language? 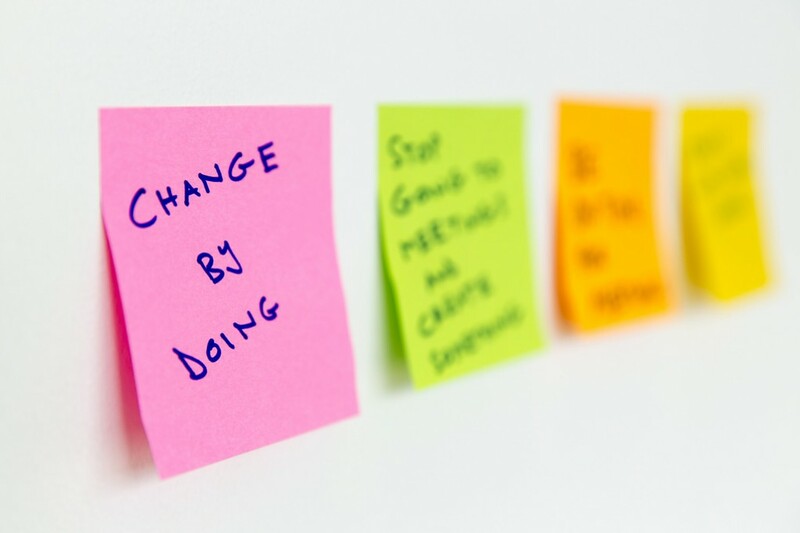 After seven years in ELT management I decided that I need to live the life that I want to live and not just continue doing what I had been doing for the last seven years, just because of the ‘conditions and status’, or because that is what everybody expected me to do. My resignation from the Open University surprised everybody, but for me it meant going back to teaching, to learning and to working directly with teenagers. On 30 August I rolled up to the pre-teaching in-service day at my new school feeling both excited and nervous. Those feelings were personified two days later when I stood at the door of my first class, waiting for the students to stand. How would they perceive me? Would they behave? Would they understand me? Would they participate in the speaking tasks? How was I going to remember all of their names? I was full of doubts, but as soon as I stepped into the room, greeted the class and started off with a ‘Getting to know you’ icebreaker, those initial doubts evaporated. I left the room feeling energized and excited to be back in my own classroom, after a seven year gap. Since then I have had a few great lessons, many ordinary lessons and some less than good lessons. Following each lesson I reflect on what went well, what could I have done differently, and did I actually meet the learning aims that I had set? I often think to myself, if I were observing this class I might have asked the teacher why she corrected that particular mistake and interrupted the student’s fluency, or, why didn’t she scaffold the task better, or had she noticed that boy in the back row, who was on his phone under the desk, during most of the speaking task. I used to think that if I am the best teacher I can be and plan my lessons really well, the students will respond accordingly. But I now think that this isn’t always enough. I used to think that if I integrate technology effectively to enhance the learning outcomes, the students will be motivated and engaged. But I now think, that sometimes this is true, but quite often, it is not. I used to think that through my teacher training I could have an impact on so many more students than I could in the classroom myself. But I now think that there is nothing more satisfying than engaging with the students themselves, in a large classroom, with all its challenges, and seeing everybody engaged and on task. Amos Paran – Who Wrote Shakespeare’s Plays or Who’s Your Will? When initially approached, some of the presenters immediately gave me an affirmative answer, “Yes, sure” or “Ok”, whilst others were more hesitant. One presenter wrote to me saying, “If truth be told, I’d forgotten that I’d allowed myself to be talked into doing a Pecha Kucha!!! I’d been thinking about chickening out, but …. hey why not! Another presenter stated, “At first I groaned – And then I thought about what I could do …. So, end of moan. I am happy to do something. Am I mad? Yes, I am.” The latter responses were similar to my own when Leo Selivan (Leoxicon) asked me to host the event. “I don’t think I can. I work full time. I’m studying etc.” I responded and then I stopped myself and thought – If Leo is asking me then he must believe I can do it, and in the words of Richard Branson, “If someone offers you an amazing opportunity and you are not sure you can do it, say yes. Then learn how to do it later.” This year’s team of courageous ELT presenters demonstrated that they also subscribe to the Branson philosophy, and as a result each of the presenters put themselves out there, and we, the audience, benefited from their experience and humour, and had a great time. Giving a Pecha Kucha is different from being a plenary or keynote speaker, it seems to fall much more into the ‘edutainment’spere, and the pressure on the presenter to ‘perform’ is not insignificant. For the host, though, once the presenters have agreed to present and their presentations have been received and checked, all that is left to do is to choose the order of the presentations, upload them onto the computer in the auditorium, check the timings, and write some introductory notes about each speaker. There shouldn’t be any surprises. However, on Tuesday 5 July, a few hours before the Pecha Kucha evening was due to start, I bumped into Mel Rosenberg and Andy Curtis, who told me that they had had an idea that they wanted to run by me. “Andy is going to do my Pecha Kucha, sight unseen. What do you think?” I looked at Andy and asked him, “Do you know what Mel’s Pecha Kucha is about?” “No, not a clue.” Andy responded. “Though it would be a great example of creativity, if I presented it without seeing it, don’t you think? Do we have your permission to do this crazy thing?” I thought to myself, Mel’s presentation is not clear to me, and I’ve seen the slides, so how is Andy going to present it? But then I thought, this could be an opportunity to do something different from the ‘traditional’ Pecha Kucha format. So I said, “Yes. I like the idea.” Andy looked a little surprised, as he hadn’t expected me to agree quite so quickly. And thus the first Pecha Kucha ‘Unseen Hack’ was born. As teachers we are always putting our students on the spot in front of their peers, asking them questions, getting them to do presentations, prepare speeches and debates and complete numerous other language tasks, that many of them don’t feel comfortable doing. Our students usually have no choice but to say ‘yes’, as the task often forms part of their summative assessment. As teachers/ELT professionals we must be role models for our students, and also be willing to put ourselves ‘out there’ in front of our peers, even when we may feel uncomfortable about the request, because saying ‘yes’, can be both challenging and rewarding. In fact, Emily Liscom (Education to the Core) would go even further, and say that by using the word ‘Yes’, to our students more than the word ‘No’, we might be surprised to experience improved classroom management and teaching strategies. 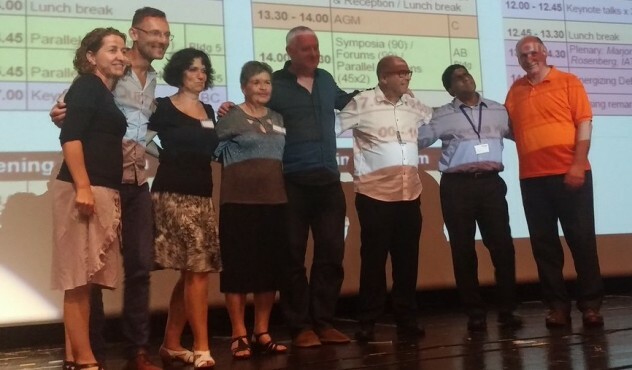 Thank you to each of the six/seven presenters for saying ‘yes’, when I approached you – each of you were courageous and inspirational, and are great role models to other ELT professionals and students across the globe. The end of the school year is Coming Soon, so here is a lesson for you to try with your students. As in previous years (2015 –The Happy Lesson, 2014 – The Way Back Home) I went into my son’s English class and gave a lesson. This year I chose to use the Kung Fu Panda 3 movie trailer, to provide the students with an engaging and fun lesson which would both be accessible for all learners, and challenging for the more advanced students, whilst encouraging students to work in groups. My son’s class were very excited about the lesson, they particularly enjoyed the Quizlet vocabulary set that I had prepared, and within the limited time created some cute Compare and Contrast Panda posters. 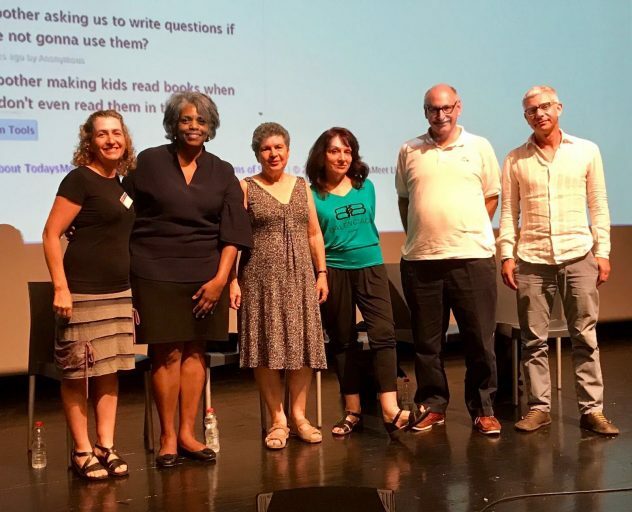 At this year’s ETAI winter event more than 50 English teachers were taken on a book discovery tour through the impressive National Library of Israel, in Jerusalem. The 120 year old library has a collection of more than 5,000,000 books, 2000 manuscripts, 700 personal archives and 30,000 hours of recordings which are available to the public, at no cost. The National Library has a resource rich Facebook page in English which is regularly updated, and provides authentic materials for English teaching. 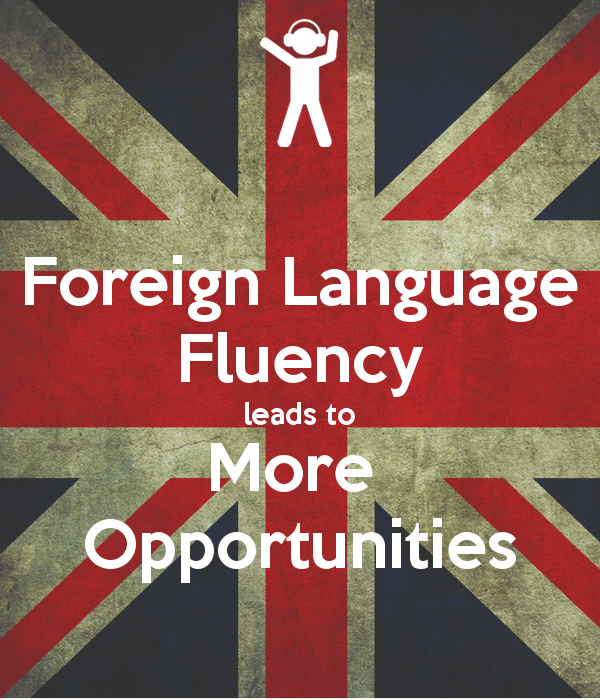 So why should English teachers teach with Primary Resources? 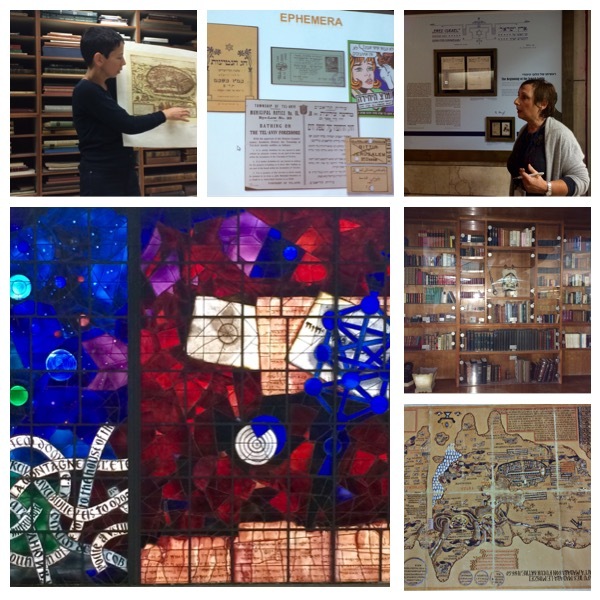 Karen Ettinger, Project Manager for Education at the NLI, explained that primary resources are motivating, relevant, make use of authentic material, enable students to practice 21 century skills, exercise their critical thinking and research skills, whilst connecting them with their past. So if you want to do some, or all of the above I strongly recommend a trip, either physical or virtual, to the National Library of Israel. Thank you to all of the National Library staff who took us on a journey which made me think differently about the role of the library in the English language classroom today. Today is International Teacher’s Day and last night I met one of the most inspiring teachers of our time. A person who shared the story of the 150 Freedom Writers from room 203, at Wilson High School, Long Beach California. The writers, who were destined for a life of poverty, violence, teenage pregnancies and worse, were reached by Erin, and were given the opportunity to change the ending to their narrative through the writing of a diary. Erin turned classroom 203 into a home, a place where there was hope, a space where the students belonged, a space where they could dream of a better future, where they ultimately changed their future. Last night I was inspired by Erin’s empathy, passion, energy and sheer humanity, I was inspired by Betty Pollack (pictured above), a Dutch Holocaust Survivor, whose brother Jack Pollack met with, mentored and inspired the freedom writers. Betty’s energy and passion for life and her story moved us all.